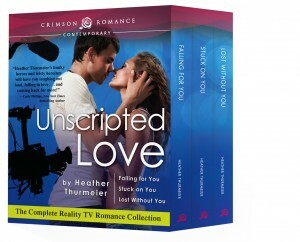 Unscripted Love is here for a price that is too good to pass up! Seriously, these .99 cent deals are too awesome for readers. But are you getting if you pick up this bundle? Well, you’re getting all the behind the scenes drama you could want out of your favorite reality TV shows! What if you don’t like reality TV? Not to worry, these books are more than just reality TV show inspired. At their heart, they’re contemporary romances with lots of relationships, friendships, steaminess, and make your heart-pound romance. “You’re jealous of my ex-boyfriend. You’re jealous of that stupid kiss with him.” She didn’t have an ounce of uncertainty in her voice. Damn it. He flinched at the memory of Cassidy and Brad kissing. Every agonizing second of that kiss was burned into his brain, and he’d done nothing but compare that kiss to one he’d had with her only hours earlier. Which had she liked more? His anger toward Brad flooded back to him. “You’re right,” he admitted bluntly, annoyed that Cassidy knew what he was really thinking—that he couldn’t hide his feelings from her. He hadn’t exactly been subtle, but he hadn’t thought he’d been obvious either. Evan stood up from the bed, mere inches separating himself and Cassidy. She took a step backward, but he caught her arm, stopping her. Minutes earlier, he’d wanted nothing more than to be far, far away from her, but now he didn’t want her to go anywhere. “I was jealous… No, I am jealous, because ever since I kissed you, I haven’t been able to think of anything else.” I’ve never had a kiss like that before. Evan swept the back of his hand along Cassidy’s cheek and traced the line of her jaw until his hand stopped under her chin. He held her there, his gaze locked on the green eyes staring back at him. His thumb stroked her bottom lip. He wanted to kiss her again. A small gasp escaped her mouth as her lips parted. The urge to kiss her flared inside him, the desire she sparked in him overwhelming. “I acted like a jerk, and I’m sorry.” He didn’t want to feel this way about her. It went against his plans, but he couldn’t help it. Cassidy was simply too much to resist.